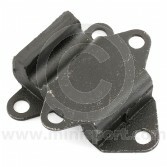 If you’re searching for Mini engine mounts to repair or to restore your classic car, then welcome to Mini Sport – the World’s Premier Mini Specialists. 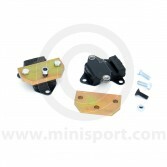 As the component that holds the engine in position, the importance of a fully functioning engine mount is obvious – this is why we have created a high-quality selection of parts and fitting kits to ensure a great driving experience, no matter if you’re using your Mini on the road, track or on the rally course. 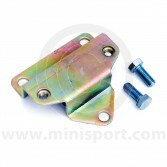 Our range of Mini engine mounts are available in a variety of materials, to suit all classic Mini models, from 1959-2001. 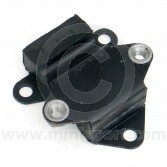 For regular road use, we recommend standard replacement rubber mounts which can be applied to both manual or automatic transmission systems, as well as captive nut, easy-fit rubber engine mounts. 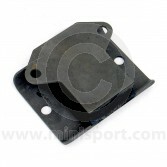 For use in motorsport, polyurethane quick-release mounts and a solid steel mounting would be ideal. 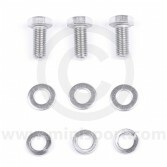 We are also able to supply special easy-fit mounting and spacer kits for the easy fitting of a manual engine into a wider automatic Mini’s front subframe, as well as a stainless steel engine mounting fitting kit. 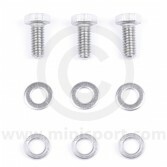 We particularly recommend our own Mini Sport brand, ‘Automatic to Manual Engine Mounting Conversion Kit’ that allows for the attachment of a manual engine and gearbox onto the broader subframe of the automatic Mini model. 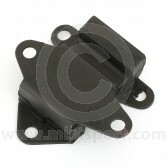 Our Mini engine mounts selection represents just a small part of our comprehensive engine components range that can be purchased for delivery worldwide. So whether you need to fix a particular issue with a single part or need to completely overhaul your engine, we will have everything you need. 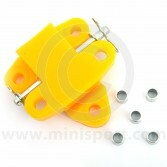 Please take a look around our website and click on each product of interest to learn more. Aside from being able to manufacture our own Mini parts, that reflect the original fittings of classic models, our 50+ years of experience in the industry has allowed us to seek out and build relationships with, some of the most innovative specialist manufacturers around. 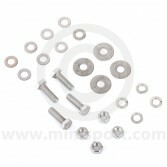 This allows us the scope to create a high-quality range of Mini parts that offers our customers everything they need to realise their perfect drive. In addition to our sales of parts and fitting kits, we also operate a Mini maintenance centre that is able to fully check over your vehicle, spotting any potential issues or finding potential upgrading opportunities that will improve its performance. 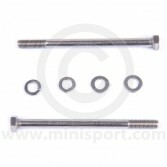 Take a look at our dedicated Mini Sport services page to learn more. So, regardless if you’re looking to repair, restore or even to reimagine the operation of your Mini, we have the expertise to help. Why not get in touch with us today if you have any questions?